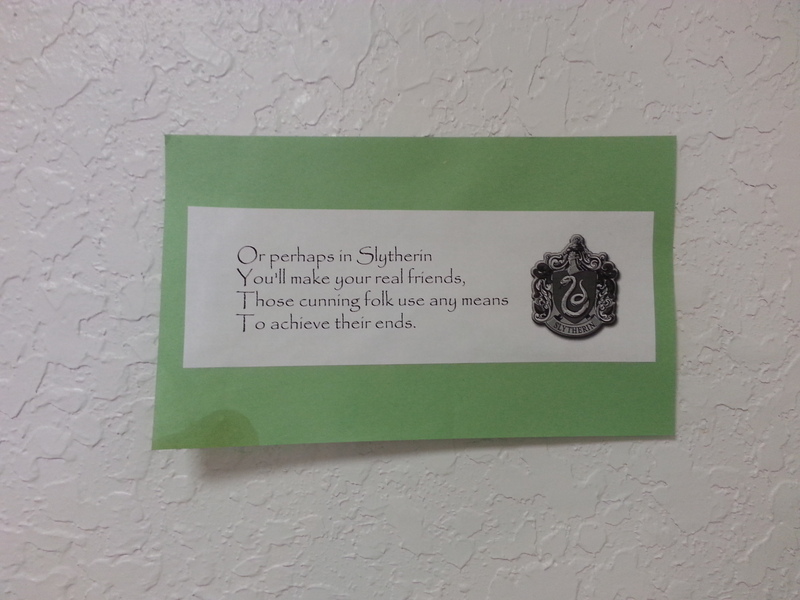 The things that really make a Harry Potter party are the small details and decorations. Yes, you can dim the lights, serve some candy and draw a lightning bolt on your forehead, but you need something special to take your party to the next level. I did that with a combination of things – the food, drinks and the decorations. 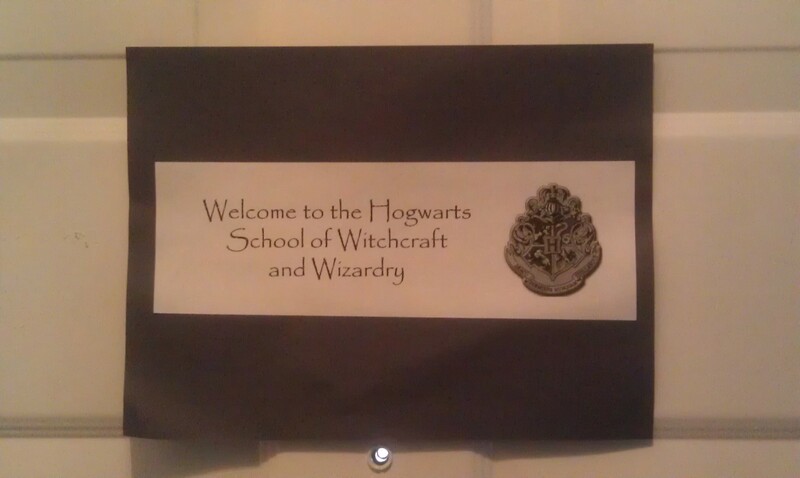 I transformed our home into Hogwarts – a Magical School of Witchcraft and Wizardry. I tried to tie as many of the classes into our meals and created a series of challenges. 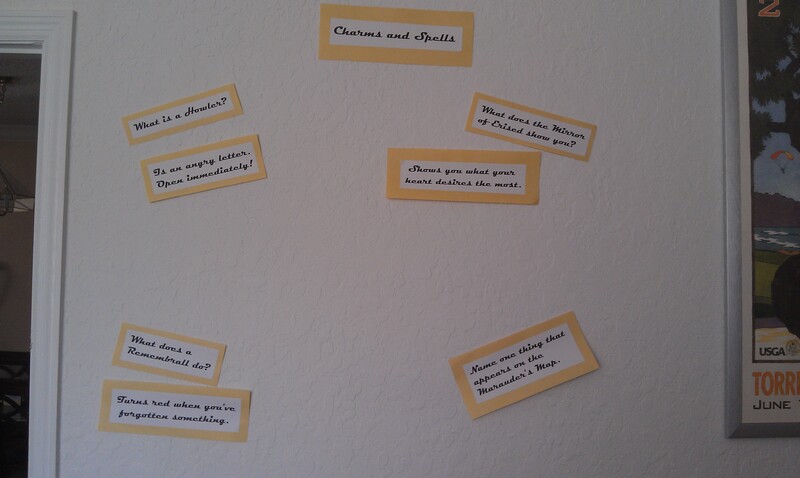 Get the questions right and you earn a special magical treat. 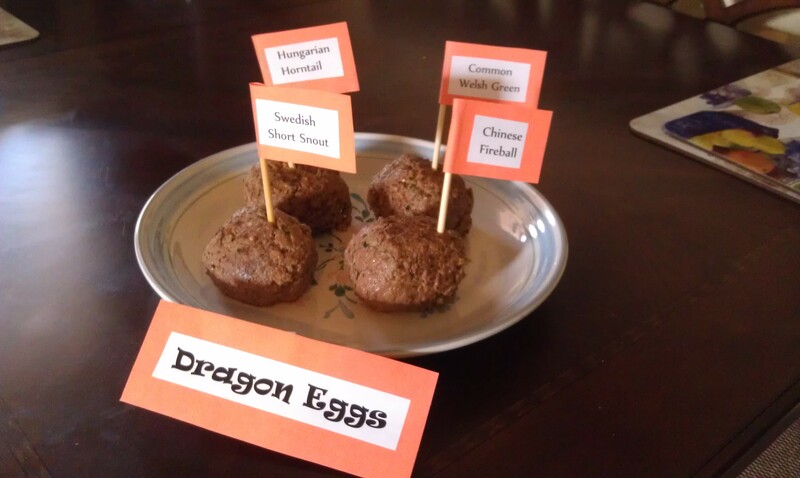 For breakfast, I served Transfiguration muffins with our dragon eggs. 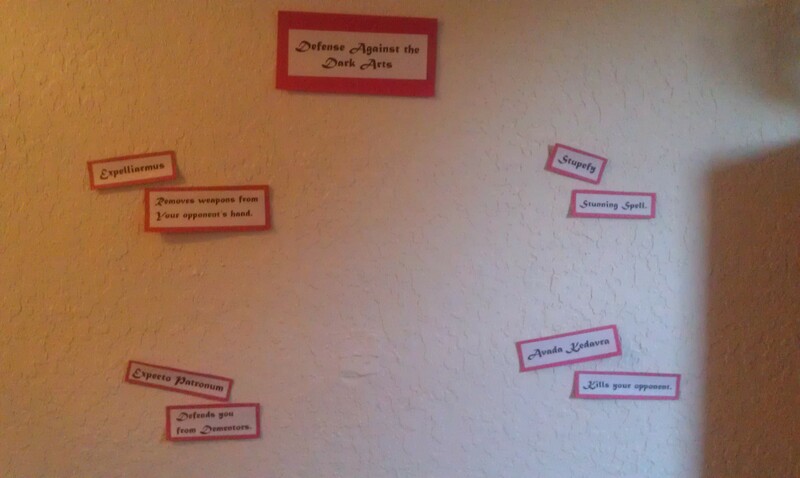 The challenges started with the Defense Against the Dark Arts. My husband had match the spells with what it does. For his efforts, he got a magic wand. 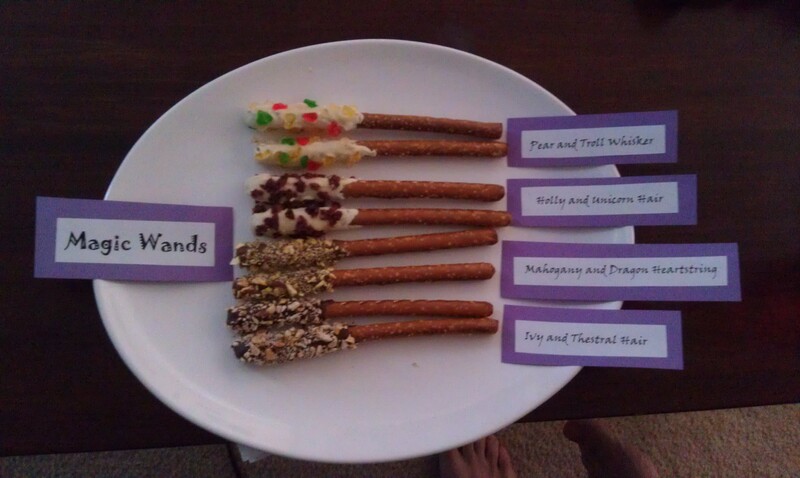 Now, our wands were simply pretzel rods dipped in three kinds of chocolate, dark, milk and white, and covered with candy or nuts. To keep with the Harry Potter theme I labeled each wand combination so they would be more like the ones you would find at Olivander’s. Try each one and see which wand you prefer. Have fun with the combinations. The Pear and Troll Whisker actually tasted really good. 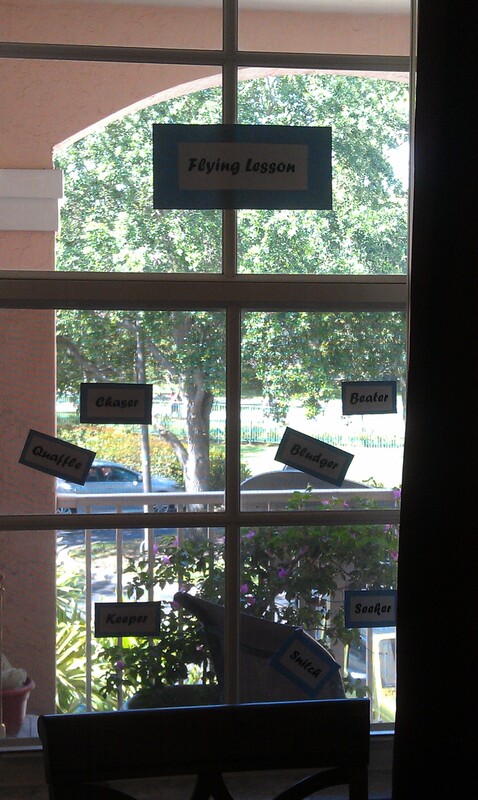 He had a Flying lesson where he had to match the different Quidditch positions with the types to Quidditich balls used. When he got them right, he received a Nimbus 2000 and a Firebolt. I used brown paper which I folded and glued together to look like a broom bottom. I filled the Nimbus 2000 bottom with my favorite gummy treats which were individually wrapped with saran wrap and tied closed. I used a milk chocolate dipped pretzel as my broomstick. 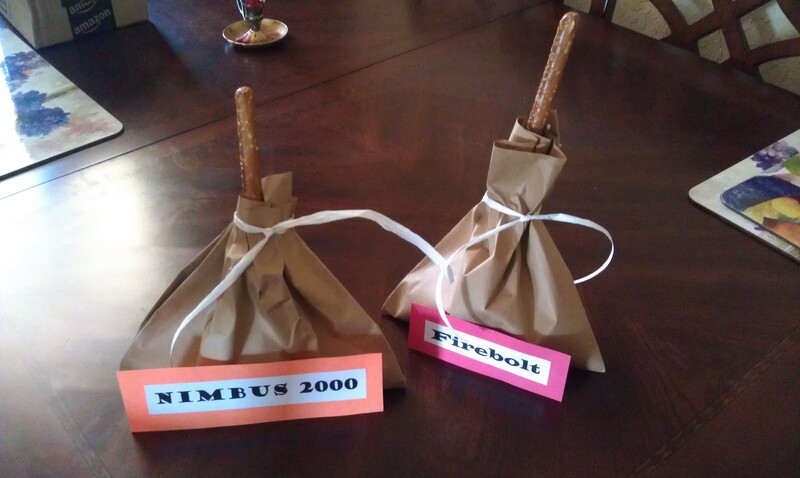 I filled the Firebolt with my husband’s favorite chocolate treats which were individually wrapped and added a dark chocolate dipped pretzel. This way we had something to snack on during the movie. 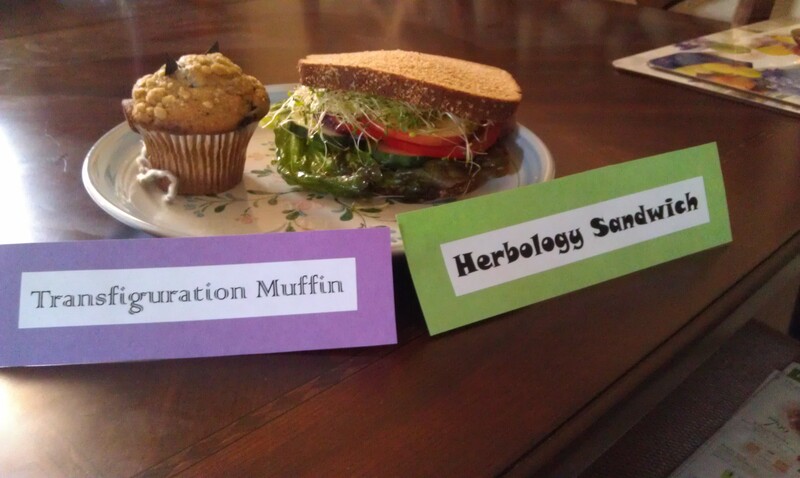 For lunch we had Herbology Sandwiches and Transfiguration Muffins. Herbology sandwiches are a vegetarian sandwiches made with lettuce, avocado, apple, red onion, cucumber, tomato, alfalfa sprouts and topped with vinegar. I used tarragon vinegar my mother had given us for Christmas. It tasted great, but the vinegar made the bread very wet. Next time I’ll use a different type of bread that can withstand the liquid. *if you look closely you can see the ears and tail on the muffin. 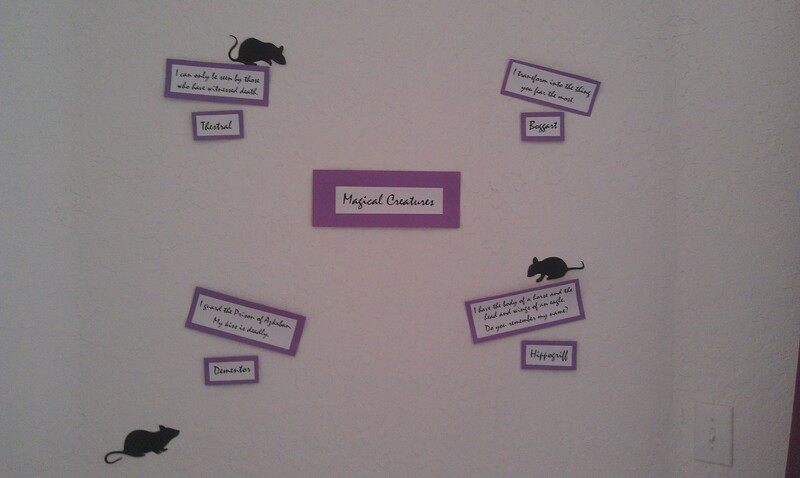 He had a Charms class where he had to answer questions about each magical object. 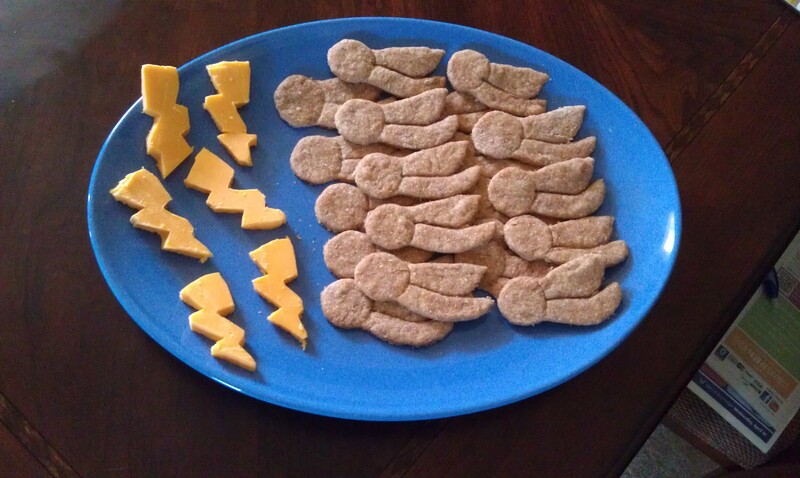 When he got them right, he got lightning bolt shaped cheese slices and golden snitch wheat crackers. See, not every treat has to involve chocolate and candy. I didn’t want to spend extra money on cookie cutters I’d only use once. Instead, I made my own with a lasagna pan I bought at the Dollar Store. For the simple designs, the homemade cookie cutters worked. For the more complicated ones, it didn’t work very well. We had tea time, of course. 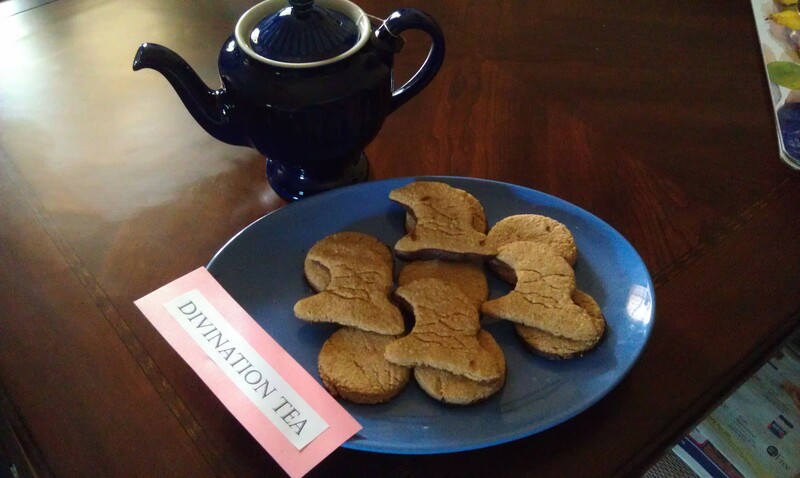 What better to serve than Divination Tea and homemade Sorting Hat digestives, a British cookie traditionally served with tea. I dipped my cookies in chocolate because that’s my favorite way to have them. 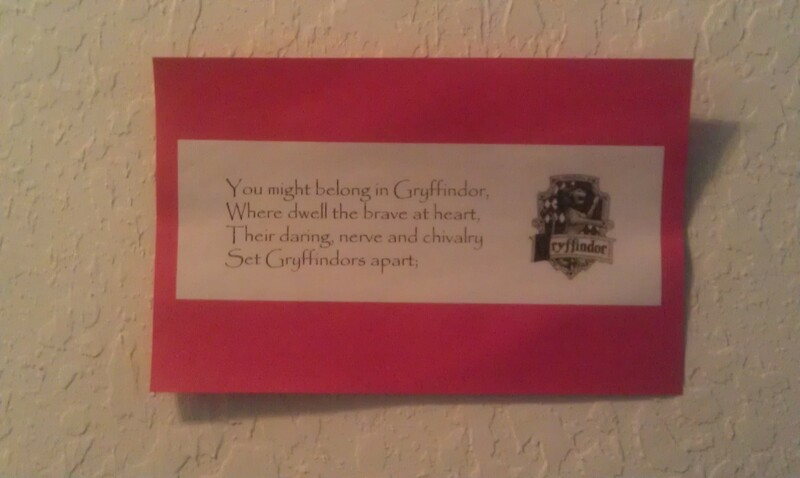 I used another homemade cookie cutter for my Sorting Hats. They tasted great, but the cookie cutters didn’t work very well. Because the design is so complicated, I would recommend buying it. 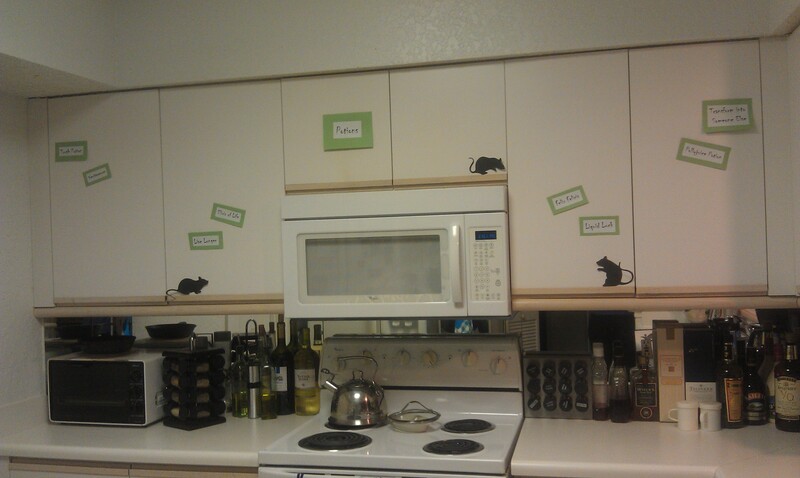 During his Potions class, my husband had to face the mice and match the potions with what it does. 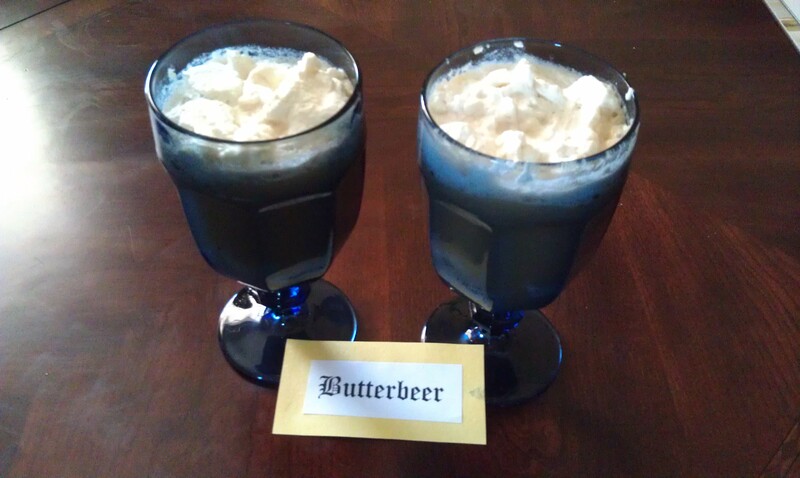 For his efforts, he got a glass of homemade butterbeer. This stuff is highly addictive and full of sugary happiness. I didn’t have rum extract so I simply used rum. I was serving it to adults so it didn’t matter. It tasted amazing. I’m planning on making it again this Halloween. Located by our dog’s crate, my husband had to match the Magical Creatures to their description. He earned a chocolate frog for each right answer. 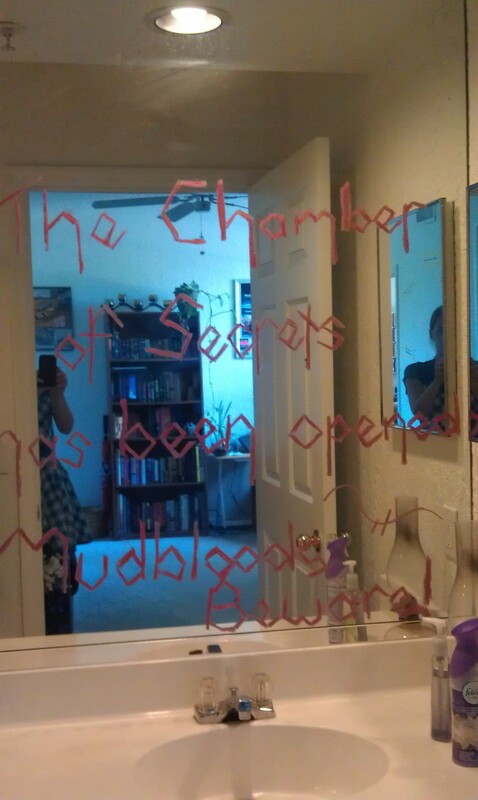 I found the chocolate frog mold on amazon.com for a very reasonable price. They’re too cute to pass up. One of my husband’s favorite chocolate treats are orange chocolates. I decided to use an orange chocolate truffle recipe and follow all of the steps except forming the truffles. 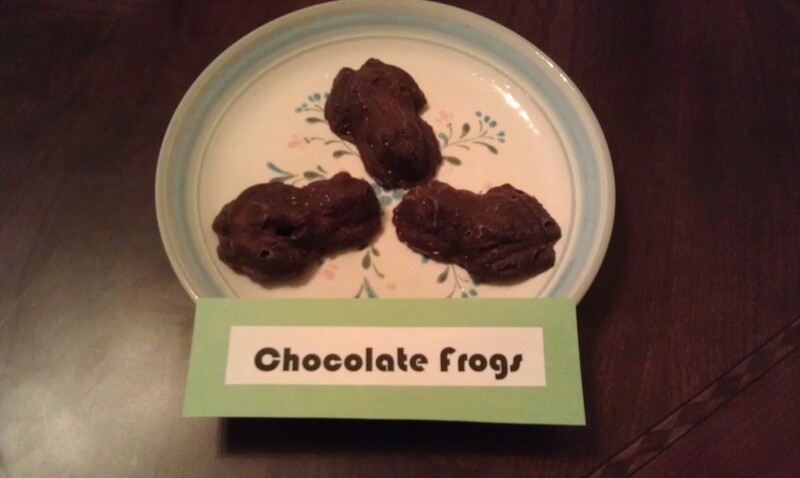 I simply put them in my frog molds. They were delicious! 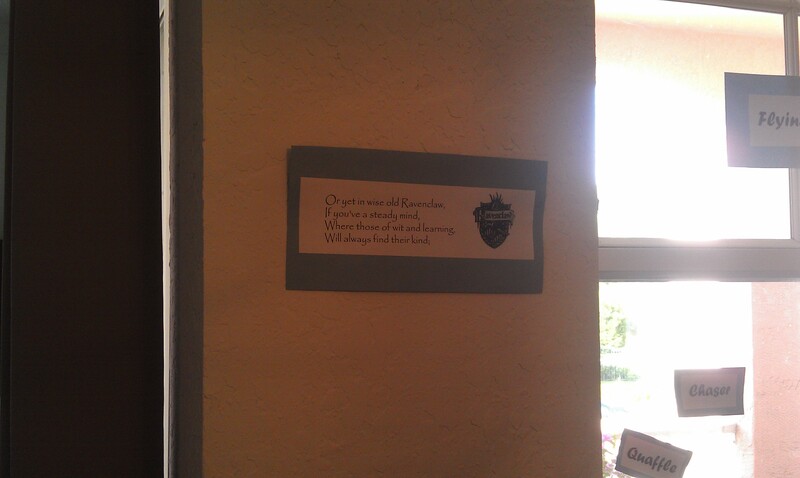 I included a few special touches throughout our home to tie it all together. As the official gift, I got my husband the blu ray set of the Harry Potter films wrapped in parcel paper and sent by Owl Post, also known as me sneaking it into our mailbox without him noticing. 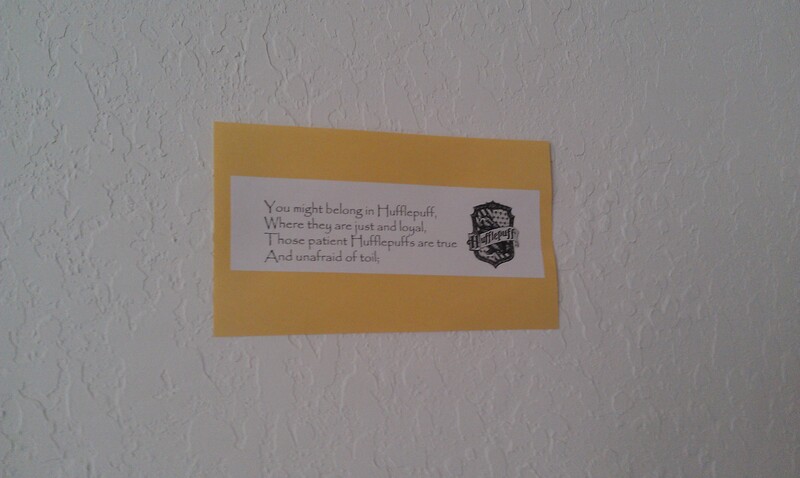 I designed his birthday card around the Maurader’s Map forewarning him that I was up to no good. He had no idea just how much I was up to until he stepped into our decorated apartment and had enough food and activities to last the whole weekend. Our magical weekend was a huge success. My husband loved it and I certainly think it’s the best birthday party I will ever throw.